For decades, Tucson has waffled between ignoring the homeless living on our streets and under bridges to over-policing them. When I moved here in 1981, the politically correct term for Tucson’s homeless was “transient”. The attitude was: They’re not ‘homeless’, and they’re not ‘bums’. They’re just passing through… transient. Ignore them, and they’ll go away. Transients were seen by the populace and the local government as another inconvenient byproduct of warm winter weather. They’re like snowbirds and college students but without money, but our capitalistic society has no use for people without money. By labeling the homeless “transients”, Tucson was able to turn a blind eye toward them. Over the years, Tucson tried to make itself more inhospitable by passing laws prohibiting aggressive panhandling and ending street corner sales of newspapers. Really… we just wanted them to go away, so we wouldn’t have to feel guilty about inaction. With the rise of Safe Park homeless encampment downtown, I fear another round of over-policing is coming, since the city is appealing a court order protecting Safe Park as a free speech protest. For the back story and ideas for the future, keep reading. After years of city indifference and feeble attempts to regulate the homeless out of existence, Occupy Tucson brought the Tucson homeless back into public view by welcoming them into their encampment and helping them. I see the Safe Park protest as an outgrowth of that action. After the 2008-09 Wall Street crash, homelessness, poverty, unemployment, and food insecurity ballooned nationwide. Millions of people lost their homes due to underwater mortgages, job loss, or medical bankruptcy. The government ignored the financial problems on Main Street, ignored the financial problems of the states, and bailed out Wall Street. Remember Occupy? Banks got bailed out. We got sold out. 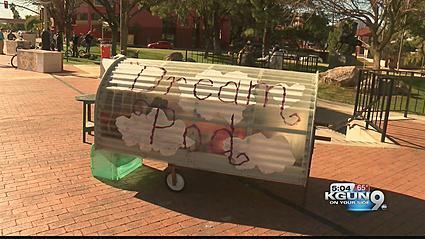 Occupy Tucson was one of the longest running Occupy encampments in the US. It was also one of the most harassed by police. Under former Mayor Bob Walkup and former City Manager and Cop Richard Miranda, Occupiers were rousted out of their tents at night and ticketed by police. At one point 700 citations had been served to Tucson Occupiers– second only to New York City. 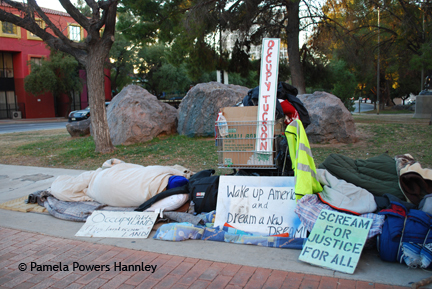 Locally, Occupy Tucson opened our eyes not only to the political messages about wealth disparity and inequality but also to basic poverty-related issues– particularly homelessness, mental health care, and hunger. 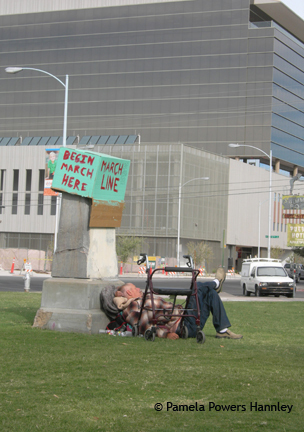 The homeless have been living in Tucson parks and on our streets for decades. When Occupiers moved in, they became a lifeline for many street people– providing free food and informal crisis management. Occupying these past 2 weeks has really opened my eyes to the numbers of severely mentally ill and homeless people shambling around our streets. Our presence in the park protects them from the ravages of “bum fights”, prostitution, and other indignities they suffer just to scrap together the money they need to survive. We feed and shelter them, just like Jesus would have done. Think of how much money is spent on arresting, prosecuting, defending, incarcerating, and probating Tucson’s most at-risk population. Or the costs of emergency room services that the City has to pick up. We provide preventative measures that SPARE THOSE COSTS. We, the people, are providing services that Big Government and Big Business can’t seem to deliver effectively. During her 2011 mayoral race against current Mayor Jonathan Rothschild, DeCamp advocated for expanding Tucson’s community centers to make them true community centers with expanded hours into the evening, in-house health clinics with screenings and basic services, tutoring, job placement, English classes, community-based police stations, and a variety of services to help Tucson residents (regardless of housing status). These visionary ideas are ever more valid today. The Safe Park protest has been expanding downtown since the 9th District Court ruled that it was a protest– not just a bunch of people sleeping on the street. The Arizona Daily Star (AKA Tucson.com) has been carrying water for the Mayor and Council, City Attorney Mike Rankin and the monied class of Tucson, who want to pretend that poverty and homelessness don’t happen here– especially not in an election year. In an article about the City’s 9th Circuit Appeal, City Councilwoman Regina Romero says the city is trying to help the homeless by giving $1.5 million to nonprofits who help the homeless. Poverty pimps. Indeed, if you Google “homeless Tucson”, a list of services and shelters for the homeless pops up– Gospel Rescue Mission, Primavera Foundation, Salvation Army, and others. If there are services available, why are people living on the street? Obviously, there is a disconnect in the system. Should the city be funneling its resources through nonprofits? What percentage of our tax dollars goes to administer these nonprofits? How many shelters or soup kitchens require people to declare their love for Jesus before they are served? Who are Tucson’s homeless? How old are they? How many are women, children, or families? Why are they living on the streets? Are they protesting? Are they addicted? Are they broke? Did they lose their home to foreclosure? Are they escaping violence and abuse at home? Do they need mental health or medical services? Do they need someone to connect them to services, like AHCCCS (Arizona Health Care Cost Containment System, Medicaid)? Or do they just need a clean, safe place to stay until they get back on their feet? Besides the people on the streets, what about the home insecure among us? The people in rattletrap, unsafe trailers. The people living in sheds without running water. The people living in tents or vehicles in friends’ backyards? The multiple Star articles focus on how and why Tucson should get rid of Safe Park– not on any real solutions to end homelessness. While we offer tax incentives to businesses and continue to ignore our vulnerable populations, other cities are studying their homeless populations and coming up with solutions. Multiple studies have shown that housing the homeless is cheaper than harassing, arresting, ticketing, and jailing them, in addition to taking them to emergency rooms when someone is stabbed or shot or has a heart attack, a seizure– or a child— on the sidewalk. Here are several articles from around the country about solving homelessness. Florida: Leaving Homeless Person On The Streets: $31,065. Giving Them Housing: $10,051. And then… there’s the whole tiny house movement. If you Google “tiny house homeless”, you’ll see a number of tiny house projects to house the homeless. Think: large dream pod with a bathroom. Although some homeless advocates see tiny houses as a solution, I think it is another way to funnel money to poverty pimps who want to build a demonstration project. Also, you’d need 1000s of tiny houses, and it would not be an efficient use of land resources. Instead of hundreds of tiny houses, why not look at the 1000s of empty foreclosed homes or old motels? Why not help people before they are foreclosed upon? At any rate, there are lots of ideas and potential solutions out there. It’s time for Tucson to take its head out of the sand. Well, what do you know. Looks as if this article sparked action– or at least meetings– about the homeless. Four days after this appeared in BfAZ, the Arizona Daily Star posted this story about what multiple groups are doing or want to do. The Occupied Tucson Citizen website has been doing some in depth analysis and reporting on homelessness in Tucson. Yes, I linked to one of their stories.